We are offering a special price of 20% off the award winning 2015 Vitesse Vineyards Napa Valley Cabernet Sauvignon. A portion of the proceeds will be donated to SAKHI Girls Education Academy in Mumbai, India. Founded by Aarti Naik, Sakhi for Girls Education creates safe and quality learning spaces for girls living in the slum areas of Mumbai, India. The donation you will make through purchasing Vitesse will help them to continue building the basic educational capacities of slum girls through community-based after school programs. VITESSE WINS GOLD THIRD YEAR IN A ROW AT THE 2018 SF CHRONICLE WINE COMPETITION! 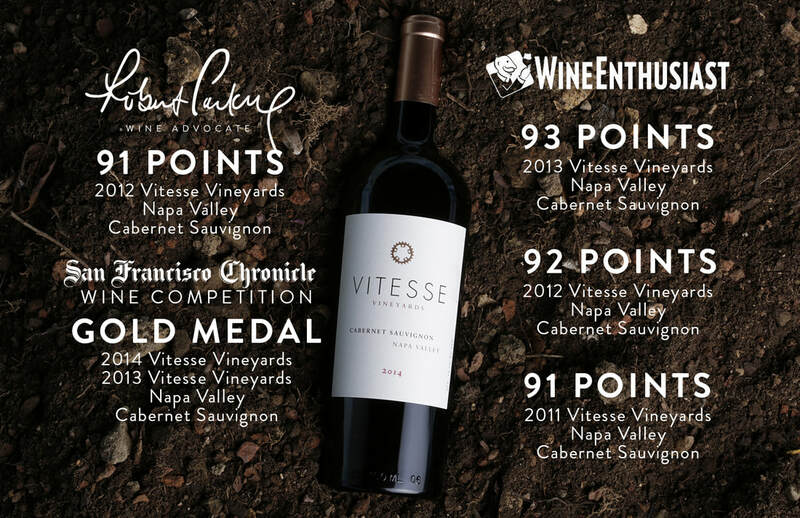 Our 2014 Vitesse Vineyards Napa Valley Cabernet Sauvignon was awarded a gold medal at the annual 2018 San Francisco Chronicle Wine Competition. With over 7,800 entries from 28 states across the country, the San Francisco Chronicle Wine Competition is hailed as the largest competition of American wines in the world. We were very fortunate and grateful to be included in the luxury Cabernet Sauvignon category as one of the exclusive few wines to receive this honor. This adds a second gold to the previous medal Vitesse received for the 2013 vintage! VITESSE RECEIVES 93 POINTS IN WINE ENTHUSIAST! Our 2013 Vitesse Vineyards Napa Valley Cabernet Sauvignon scored 93 points in the April 2017 issue of Wine Enthusiast Magazine. Reviewer Virginie Boone said that Vitesse "continues to impress — a deft concoction of dusty leather and pencil shavings that's elegantly structured and integrated. Red currant and clove add seasoning to ripe blackberry and dark chocolate flavors." This puts us in the hunt for the "maillot vert" when you consider our 2011 Vitesse received 91 points and the 2012 Vitesse scored 92 points! Robert Parker reviewed our 2012 Vitesse Vineyards Napa Valley Cabernet Sauvignon and gave it 91 points. Parker called it "a sleeper of the vintage" with "Bordeaux-like acidity and "beautiful, pure, red, blue and black fruits, a touch of earth and sweet tannin." Vitesse is the perfect wine for any special occasion where you want to treat yourself to something truly special. It is the perfect "Domestique" for food, and will complement any meal. It's also a great gift for your favorite wine enthusiast, cyclist or anyone who just enjoys a beautiful, well-balanced wine.